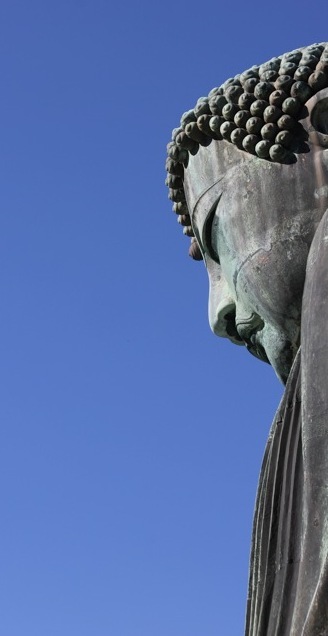 Once the proud capital of 12th and 13th century Japan, Kamakura is a favorite place to visit. It has a whopping 65 temples and 19 shrines, along with a charming pedestrian shopping street, where you can find lacquered woodcarvings, Kamakura’s best known product. Easy to get to by train or car from base, Kamakura offers a pleasant and peaceful environment nestled between the sea and woodlands. 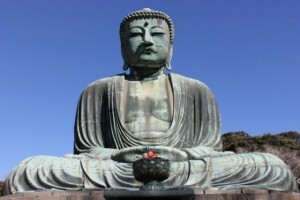 Kamakura is famous for the great bronze Buddha (Daibutsu), which sits in peaceful repose in the Kotokuin Temple courtyard. 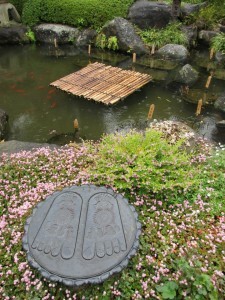 A walking tour of Kamakura is the recommended way of visiting the sights. A question you will often be asked after arriving in Yokota is “have you seen the Big Buddha yet?” This great bronze statue, Daibutsu, is located in the Kotokuin Temple courtyard. 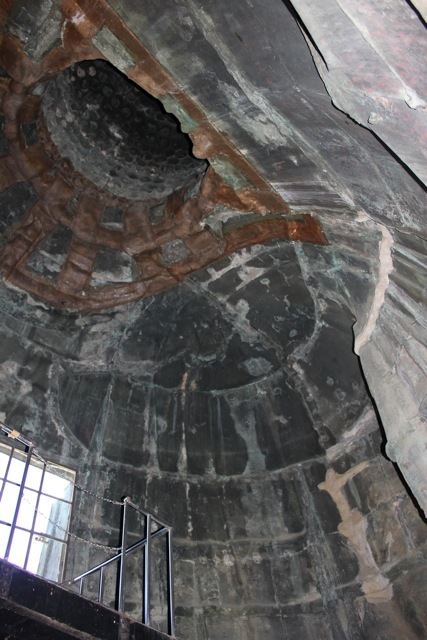 The original enclosure for the statue was damaged in 1369 by a storm, as were the second and third wooden enclosures. The fourth was carried away by a tidal wave in 1495. The open exposure permits one to view this magnificent work of art unhindered. The circular protrusion on the Buddha’s forehead is made of silver and represents a jewel from which light is supposed to flow. The Great Buddha is a representation of Buddha Amitahba, the Lord of the Western Pure Land; Amitahba means “Infinite Light.” The proportions of the Daibutsu are so finely worked that, even though anatomically out of proportion, one feels an intimacy with the Buddha when standing on the ground and looking up to view its 44 feet in height. The head is inclined slightly forward and the Buddha is seated in the traditional meditation posture with hands laid in the lap with palms and thumbs touching, which represents the Buddhist sign for steadfast faith. The half-closed eyes depict the passionless calm and perfect repose, which is the essence of Buddhist doctrine. It is also possible to go inside the Great Buddha for 20yen. Another striking feature of Kamakura is the Hase Kannon Temple, which features the eleven-headed gilt statue of Kannon, goddess of mercy. The tallest wooden image in Japan, the 30-foot high statue is said to have been carved in 721AD by monk Tokudo Shonin. 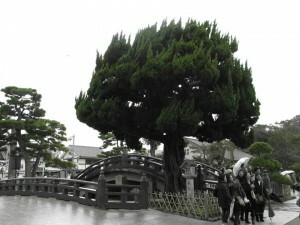 The image of Kannon, which sits in the Hase Temple south of Nara, was carved from half of a camphor tree. A duplicate image carved from the other half of the tree was thrown into the sea. After floating 300 miles, and 15 years later, the figure came to rest on a beach in Kamakura. The temple was built to enshrine this half of the tree at Kamakura. On the path leading to the temple housing the Kannon figure in Kamakura is the Jizo-do (Jizo Hall), which is lined on both sides by thousands of bodhisattva. Jizo is a bodhisattva symbolically representing the blessings of the earth who stands at the border of this life and the next, guiding souls of the dead on the road to salvation. Thousands of tiny Jizo line the hall, placed there by mothers who have lost infants through miscarriage or abortion, and who dedicate the small images as a means of praying for the guidance of the dead child. DIRECTIONS: For directions, check the Yujo Recreation Center. If you are taking the train, the closest station to the Big Buddha is Hase (Kanagawa prefecture). The GPS coordinates to the Big Buddha site are 35.31676, 139.535704. If a same day drive out and back is unappealing, consider staying at the Navy Lodge at Yokosuka, This Navy Lodge is recently remodeled. Our unit included a small kitchen. The Navy Lodge is located next to Chili’s. Another option for staying at Yokosuka is the Gateway Inn. They have one bedroom units with full kitchens. The sofa-bed wasn’t great here, but the management said they will be upgrading the sofa-beds Sept 2013. The base is hilly, located on the water, and is port to many large ships and submarines, making it an interesting contrast to Yokota. GPS coordinates to base entrance: 35.283086, 139.666076. To avoid parking in Kamakura, it is possible to park at Ikego Housing Area located 10 kilometers from Yokosuka at GPS coordinates: 35.303726, 139.590481. Get directions from Yokosuka ITT. Drive through the gate and turn right, there is a parking lot after the ball field. The Jinmuji train station on the Keio Railway line is just outside the fence and there is a pedestrian gate set up at the station. Cross the tracks and take the train one stop to Shinzushi. The trick is you’ll have to take a 3 minute walk North to another train station from Shinzushi. Enter Zushi train station, on the JR Railway line and take the train one stop to Kamakura or if doing the hike suggested below take the train two stops to Kita-Kamakura. To reach the Big Buddha, change trains again inside the same train station, and head to Hase station. From here walk to the Big Buddha. There is also a nice 6 kilometer hike from the temples at Kita-Kamakura train station across the ridge-line and down to the Big Buddha. 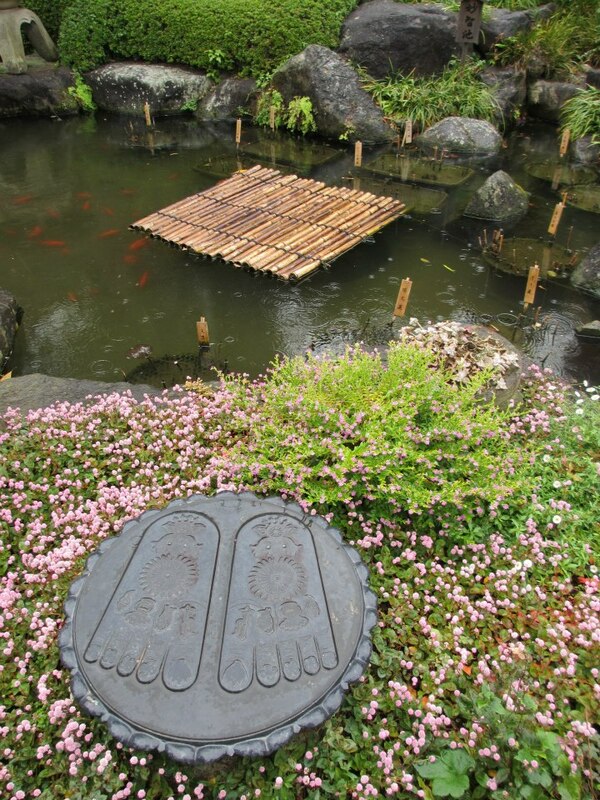 The trail is called the Kamakura Daibutsu Trail. It starts just to the left of the Jochi-ji Zen Buddist Temple entrance, located about an 8 minute walk from the Kita-Kamakura train station. Click here for more trail information.- Directions updates Sarah Straus, December 2012. Top three photos by Kelly O’Donnell, Jan 2014. Second two photos by Katheryn Wolfe, 2013. Comments by Sarah Straus, May 2013 – Our family stayed at Yokosuka for two nights so that we could see the Great Buddha and explore the area a bit. We saw it… but spent most of our time just up the road at Enoshima. There is a beautiful stretch of coast line here with lots of paid parking lots where you can park, cross the road and spend the day on the beach. The water is warm and perfect for kids to play in because of its gradual entry and gentle waves. Before crossing to the Enoshima peninsula there is a large aquarium and there are lots of places to eat along the waterfront. 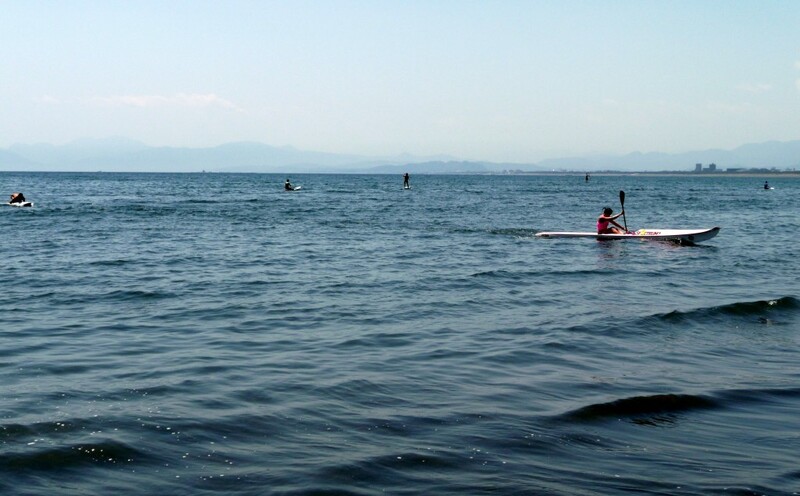 For more information and photos of the area check this Enoshima travel guide. This entry was posted in Daytrips, Top 5 Day Trips. Bookmark the permalink.